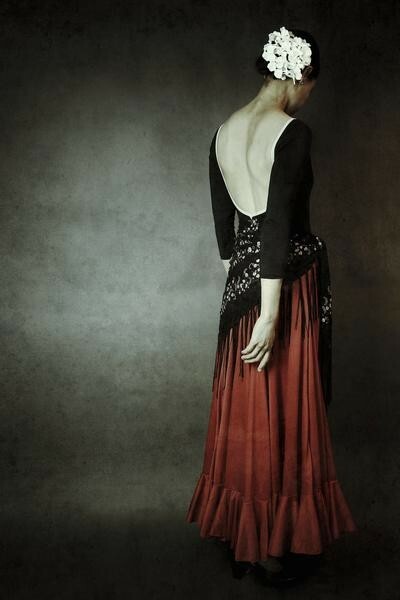 Born in Santo Domingo, Dominican Republic, Josephine Cardin is a fine arts photographer who grew up in South Florida, and is now living and working in Rochester, NY. Most recently Cardin was honored with a first place award by the Prix de La Photographie (PX3) for Between Lock and Key; has received honorable mentions for the 2014 and 2015 Julia Margaret Cameron Awards; was selected as a finalist for the Photographer’s Forum Magazine’s The Best of Photography 2014. 1- Tell us a little bit about yourself. I’m a former dancer turned photographer. Though my current work is figurative, I actually started as an architectural photographer, but having been a dancer I think I always had that draw to the human form, emotions, and telling a story. I started self portraiture work out of necessity to learn studio work when I didn’t have models, but what started as experimenting became my passion, and I now primarily focus on self-portraiture work. It allows me to combine everything I love doing creatively: performing and photography. 2- Are you formally taught or self taught? And what has been the best source of information along this journey (workshop, online forums, classroom, mentor, etc)? I both formally studied art in the university, as well as learned it in my own. I began photography as a teenager when my father handed me down an old Nikon of his. I had always made art somehow, but instantly fell in love with the camera. From there I read everything I could and practiced on everything and everyone. I think younger photographers lose sight of learning every aspect of their craft. It’s not just about learning a photoshop trick, it’s knowing your camera’s abilities, how to compose an image, and how to break rules to achieve your own voice and creativity. Now I learn by experimentation and inspiring myself with all kinds of art, not just photography. 3- You have an amazing ability to create powerful images that capture spirituality, dreams, visions and strong symbolism. What attracted you to this style of imagery? I think it more chose me. I never set out to create the images I do, and never imagined I’d be a studio photographer. The moment I started experimenting this way I was instantly drawn to having the ability to create a story. I never thought about it. It naturally went that direction for me and so I focused on series based works that would allow me to take my ideas and tell a full story, whether literal or abstract. I’m greatly inspired by who we are and what we experience in life. The emotions that drive us, break us down, and transform us. 4- What gives you ideas and inspires you to create such amazing imagery? Life. My experiences, the experiences of others, and the human emotions we all share in common, regardless of our backgrounds. Music and lyrics are another great source of inspiration for me. I listen to a lot of music and save lyrics that move me somehow. In the end, each series is something of a performance to me, where I get to express whatever emotion I’m trying to convey. 5- What type of cameras do you shoot with? Canon 6D. I enjoyed my old Nikon, but fell in love with the Canon when I switched a couple of years ago. It’s amazing in low light set ups, which is most of what I do, and allows me the functionality of a remote shutter through wifi. 6- How important is Photoshop in your final images? I try to do as much as possible in camera, but with the type of work that I do Photoshop is extremely important in the final stages of my work. It allows me to make magic and bring my stories to life. 7- Can you briefly explain the story and editing behind your two favourite photos from Arcangel Collection? From the series Keep Me Silent, this was about harbouring the weight of lies, and having to release yourself to the truth. 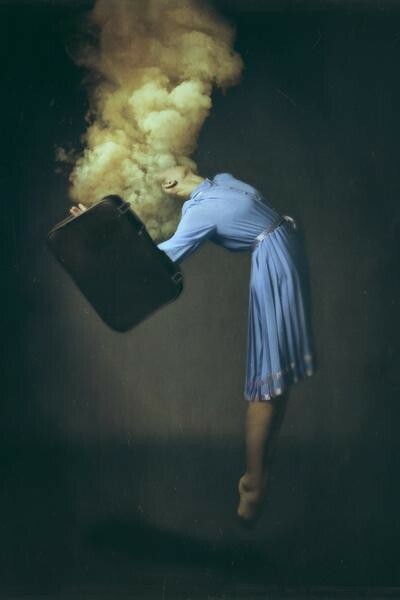 I used photoshop a lot for this…the floating effect, as well as layering the smoke to make it look like it was coming out of the suitcase. It’s an important series for me because it started a more conceptual direction in my work, which I’ve now had a great deal of success with. The image from the series Bailaora is especially meaningful to me, as it was the very first figurative self-portraiture series I did. This is what made me fall in love with the process and focus my work in this direction. It was very simple, and almost painterly, depicting a flamenco dancer, which is an art form I’m passionate about and have done for many years. 8- The hardest part of your work? and the best? The hardest part of my work is that in doing self-portraiture you have to be much more organised and prepared to know exactly what you want to shoot. Because you have to set up a shot and wait for the shutter. Versus when you shoot a model, they can move freely as you shoot. The best part is getting to make art. It’s a freeing feeling to have a vision pop into your head and then get to make something out of it. Getting to tell a story. 9- Are you aware of the new book titles related with your imagery? Not yet, I’ve only just seen a couple, but am excited to learn of them all. 10- What do you think of the stock photography industry at the moment and where do you see it in 5 years from now? I think there’s some great innovation at the moment, especially with an agency like Arcangel that is geared towards a specific type of imagery, instead of a huge site that has everything. You also care about the artists you represent, versus everyone just being a number.